A few months later, it was Satoshi who suggested measuring the eclipse’s brightness, feeding Jim’s interest in atmospheres on other planets. 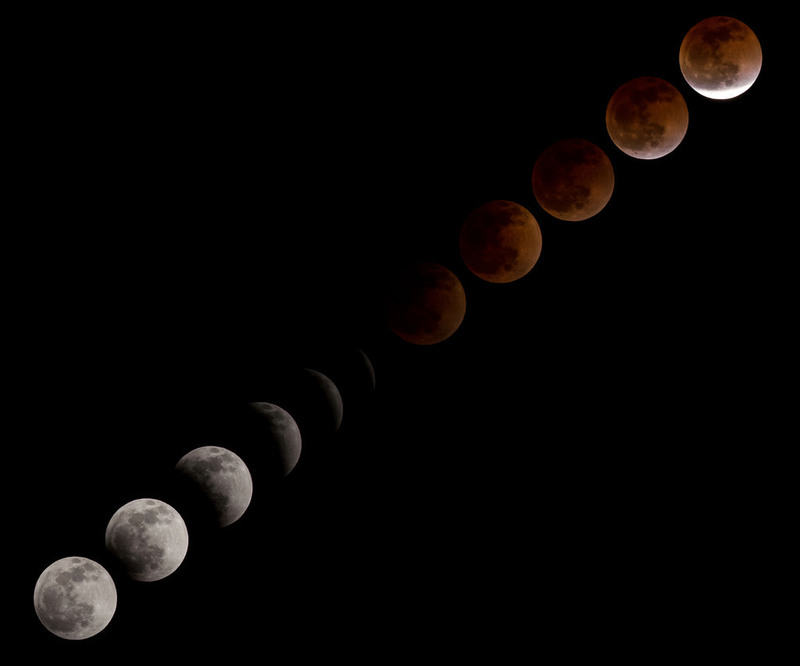 “Observing the lunar eclipse in 1963 forced me to think about aerosols in our atmosphere,” Jim told me. “That led to thinking about Venus aerosols.” In an undergraduate seminar course Jim had given a talk about the atmospheres of outer planets, which James Van Allen had attended. The elder scientist told him that recently measured data was suggesting Venus’ surface was very hot. Aerosols stopped light reaching the Earth during the eclipse – could they be warming up Venus by stopping heat escaping, Jim wondered? That would become the subject of his PhD, and Satoshi and James Van Allen would be his advisors. Working out how aerosols affected Venus’ climate would take detailed calculations on early computers of how heat energy passed through its atmosphere. One option, breaking the atmosphere down into thin layers and then adding them together, had been developed by Sueo Ueno at the University of Kyoto. Satoshi got a grant to study in Japan, and took Andy and Jim with him. While in Japan, Jim applied for a research post at NASA GISS, got it, and suddenly found himself with an imminent deadline for his thesis. Pressed for time, Jim turned to supercomputer-based models developed the US National Oceanic and Atmospheric Administration (NOAA)’s Suki Manabe, which used single columns of gases and aerosols to represent a whole planet’s atmosphere. But even that was too complex and time consuming. To finish his PhD in time to start his new job, Jim was left to rely mainly on his own calculations and intense focus. 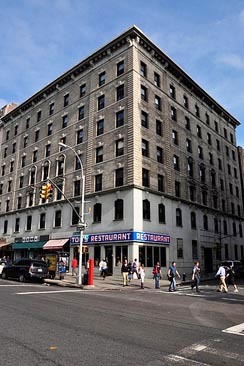 Starting at GISS – located right above Tom’s Restaurant in Manhattan, made famous by Suzanne Vega and Seinfeld – in 1967 Jim now had access to a much bigger computer. That meant he could continue improving our understanding of Venus’ atmosphere, a topic he stuck with until the early 1980s. He had been hired to look at how light and other radiation warmed planets, including how scattering by aerosols interfered with this process. In 1969 that quest sent him on a year-long stint to Leiden, the Netherlands, where he met his wife Anniek. However GISS director Robert Jastrow invited Jim back to lead the design of an instrument to go on a NASA Pioneer probe destined for Venus. After just six months in the Netherlands, and briefly honeymooning and watching an Apollo launch in Florida, Jim returned to New York. Steve Schneider (left), Jim Hansen (centre), and S. Ichtiaque Rasool (right) at NASA Goddard Institute for Space Studies in New York, circa 1971. Image copyright Stephen H. Schneider, used with permission. In 1971 Jim’s GISS coworkers Steve Schneider and S. Ichtiaque Rasool used the new methods to make a controversial and long-remembered prediction of global cooling. They’d wrongly assumed that man-made aerosol pollution would spread across the world, reflecting the Sun’s warmth back into space, while their oversimplified model underestimated CO2’s greenhouse effect. But Jim’s fellow eclipse observer Andy Lacis was now working at GISS, and as part of a larger team the pair devised a new model that would soon help underline the error. Built from scratch and perhaps reflecting Jim’s PhD struggles, it was at least ten times as fast as other methods. Published in 1974, the new model found the amount of warming at Earth’s surface caused by a doubling of CO2, known as climate sensitivity, would be around 4°C. That was double the figure that came out of Suki Manabe’s NOAA model and so, in 1979 a US government-commissioned report split the difference between them. Predicting that CO2 levels in the air would double over the next century, it forecast temperatures would rise by 3°C, plus or minus 50%, giving a range from 1.5-4°C. We can send a probe to Venus, but can we understand Earth’s climate? The increasing power of climate models to explore and explain processes on Earth inspired Jim to return to the eclipse data he’d collected in Iowa. “I tried to use the Agung volcanic aerosols as a test of our understanding of global climate forcing and planetary response,” he told me. He found good agreement between modelled temperatures and observations, but was cautious about that result as at the time there was no temperature dataset that spanned the entire world. With Jim’s interest in Earth’s climate growing, he came to the tough decision that he would have to resign from the Pioneer Venus mission. He felt obliged to ask University of Arizona’s Donald Hunten, the mission’s ‘father’, for permission. The gruff response he got back was at once cryptic and a career-defining moment. “Be true to yourself,” Donald had said. 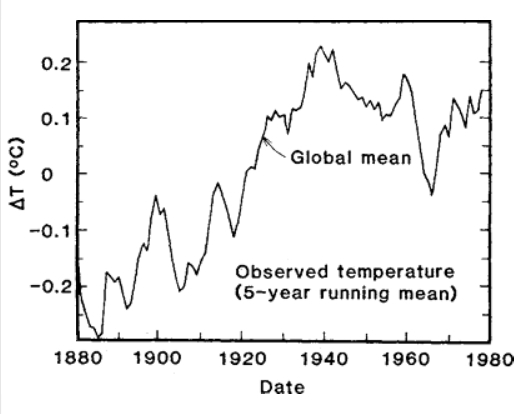 The first reliable global measurements of temperature from NASA, published by Jim Hansen and his colleagues in 1981, showed a modest warming from 1880 to 1980, with a dip in temperatures from 1940 to 1970. Graph adapted from Hansen et al. 1981, copyright Science/AAAS, used with permission, see citation below. As this work was unfolding, GISS director Robert Jastrow invited Jim for lunch with Walter Sullivan, the New York Times science reporter, at the Moon Palace, a Chinese restaurant opposite their offices. “He took me along to talk about a proposed mission to the outer planets,” Jim told me. “I thought that I should send him the thing that I was really working on.” Walter and his editors found our impact on the planet so striking the story put the greenhouse effect on the front page for the first time. A follow-up editorial declared that radical energy policy change might become necessary. Soon afterwards Jim would replace Robert as GISS director, but that didn’t mean he avoided a bad reaction. Ichtiaque Rasool, by then working in Paris, suggested Hansen had emphasised ‘the worst case in order to get the attention of the decision makers who control the funding’. “Somehow Ichtiaque got a burr under his saddle,” Jim recalled. “Several people asked me what was going on with him, and one suggested that he was jealous of the publicity the paper got – and he didn’t like the conclusion that greenhouse gases overwhelmed the effect of aerosols.” The accusation of using exaggeration to greedily grasp for cash is still directed at climate scientists today by people suspicious of their motives. The headlines in fact had the opposite effect, driving the US Department of Energy to withdraw promised funding for GISS, and forcing Jim to lay off five researchers. But despite this setback, and a shyness that often makes it hard for him to talk, Donald Hunten’s advice would stay with him. As his understanding of the threat from climate change grew, Jim would speak out with increasing force, becoming the loud and often controversial voice for action he remains today. This is the first part of a profile of Jim Hansen. Read part two here. In 1981, Jim Hansen, Andy Lacis and their colleagues predicted the impact of CO2 emissions on global temperatures between 1950 and 2100 based on different scenarios for energy growth rates and energy source. If energy use stayed constant at 1980 levels (scenario 3, bottom lines), temperatures were predicted to rise just over 1°C. If energy use grew moderately (scenario 2, middle lines), warming would be 1–2.5 °C. 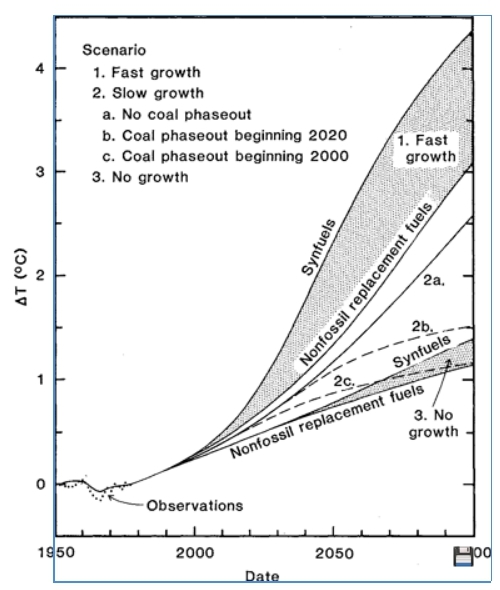 Fast growth (scenario 1, top lines) would cause 3–4°C of warming. In each scenario, the warming was predicted to be less if some of the energy was supplied by non-fossil (renewable) fuels instead of coal-based, synthetic fuels (synfuels). Image copyright Science/AAAS, adapted from Hansen et al 1981, used with permission, see reference below. I got the main outline of Jim’s life and inspiration from his book, ‘Storms of my Grandchildren’. 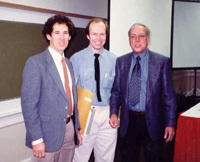 Most details of Jim’s early career come from Spencer Weart’s interviews with him, conducted in the year 2000 and now hosted by the American Insitute of Physics’ Oral Histories Project. Others come from profiles by Elizabeth Kolbert in the New Yorker in 2009 and by David Herring on the NASA Earth Observatory website from 2007. Of course, one of the arguments against anthropogenic global warming is that other planets have warmed as well since we have been monitoring them. Who exactly is making these arguments? Do they have greater experience of studying planetary atmospheres than Jim Hansen? A link or some other citation would be nice, too! Bit of a motley crew this lot, a medical doctor, a theoretical physicist and an anonymous author. Abdussamatov may have similar experience to Hansen, but it’s worth remembering 1) Russia’s huge fossil fuel interests and 2) The fact that Russia is one of the countries for whom wheat yields, for example, are set to rise. His findings do seem a bit odd, as the response by other scientists in the piece you cite shows. I have to ask again, why do you trust what these people say? (p. 130) “Mars has warmed by 0.65 C between the 1970s and 1990s, similar to the Earth’s rise over the last century. Marcus, 2004: Prediction of global climate change on Jupiter. Nature 428:828-831. Thank you – I’ll have to use this in a later instalment of this profile! Hansen is a great person. Born in the same state where I live. I’m sure. But, thanks for the suggestion. I like it. James Hansen told the US Congress in 1988 that the world would warm by 0.5 C per decade till 2050. 2013: 0.10-0.23 C per decade. The observed warming (HADCRUT4) 1950-2013 has been 0.108 C per decade, and (HADCRUT4) 1996-2013 has been 0.085 C per decade. Interesting points. Consistent warming then! For me the 1988 estimate isn’t too bad given the computers they were working with then – I think that was the year I got my Commodore 64. The estimates do look too high right now. For me that’s not a bad thing. If warming does turn out to be slower than the estimates then that gives us more time to make up for our sluggish response to the situation. I doubt that NASA were using Commodore 64s to launch their space shuttles to the space station in 1988 🙂 So we have about 5 times longer (based on observations) before we reach whatever the magic number is than Hansen thought. I know you think I’m alarmist. I guess in one sense I am keen to ‘raise the alarm’, tell people of a threat that needs action. In another, I don’t feel like there’s cause for alarm, because I believe humanity can get through this. But doing that takes looking at the facts and acting accordingly. With the right amount of effort we can bring warming under control, and adapt to the level of warming that we will experience. For me, that’s where the debate should be, how we do that. I deeply respect the extent that you engage with and try to understand the science – you’ve taught me a thing or two. But sometimes the evidence you and others bring up is quite dubious, and that’s when I find myself thinking most, ‘It’s time to move the debate on’. In reply to Marco (who doesn’t have a ‘reply’ link next to his comment) the Rense article was pro-IPCC. Again this is getting complicated, because I can’t ‘reply’ to Andy’s last comment, but he talked about missing a 2 C target. As I have mentioned previously, from 1695-1733 the Central England annual average temperature increased from 7.25 C to 10.47 C (10 year running mean, as computed by the Met. Office Hadley Centre, 7.97 to 9.90 C) – so what’s so special about a 2 C rise in the future ? Why is 2 C a target, and what’s expected to happen if we miss it? Why 2 C in particular, and not 1.5 or 2.5 C ? Why is it detrimental ? Why might it not even be beneficial to some, particularly those in extreme latitudes, for example ? 1. The Central England Temperature record is not nearly reliable enough to make such large claims about differences between years. For example, in-between 1703 and 1722 there is no local record. The temperatures in that time period come from Utrecht (The Netherlands) adjusted based on certain meteorological conditions. There are plenty of other issues, and you’d do well to read the original papers on the topic. There’s a good reason the Met Office doesn’t start the series before 1772. 2. Central England is not the world, and we’re not talking about relatively short periods with a 2 degree higher temperature, but a sustained, decades-long higher temperature. If you know that 6 degrees is the difference between current conditions and an ice age, you just may reconsider what that 2 degrees means for the world. To give one example: 2 degrees is ultimately +6/7 meters higher sea levels. It may take a few centuries to get there…if we’re lucky. 3. The 2 degrees is somewhat of an arbitrary target, mainly based on what can be achieved and when impacts are likely to become really, really bad. 4. Why is it detrimental? Let’s start with sea level rise: +1 meter is already enough to create significant problems in several large cities around the world. The Netherlands will need to spend a few % of its GDP to adapt to that. Miami is already seeing trouble with the rising seas. New Orleans, especially with American approaches to adaptation, is doomed. Shanghai cannot handle a few meters, nor can the region east of Hanoi, south of Kolkata, and significant parts of Bangladesh. Try to look up how many people we’re talking about. Then there are region that already have problems with sustained droughts. They’ll become essentially unlivable, unless you live like the current desert dwellers in Africa. The Midwest of the US may get another dustbowl…times two or three. That’s a whole lotta agricultural land that is in trouble. Australia has already seen some recent heatwaves that caused the people living there to reconsider their livelihood. To hot for anything, move to the coast. And so we can continue. 5. Could there be benefits? Depends on how you rank something as a benefit. I’m pretty sure the Inuit aren’t too happy to see their culture being slowly destroyed because the landscape is changed. You may not see that as bad: “not so cold! Less snow!” but for a people who have for centuries made this their home it’s not funny. There will be regions where the impact on culture may be more limited, but imagine the French having to adopt the Spanish siesta culture, because it is too warm in summer to do anything during the day. Skiing in the Alps? Likely very unreliable. There will be years where it’s excellent, and other years where there is no snow. If projections are even remotely accurate, with 2 degrees half of the Olympic Winter Games cities of the past 50 years would not be able to reliably host such games. The chances of not having proper winter conditions would just not be present. Plenty more examples if needed! Thank you for your comprehensive reply. As you say, it may take a few centuries to get there; and there will undoubtedly be warming and cooling periods mixed in with that, as there were (for example) towards the end of the 19th. century in the CET. Even if we start in 1772 there are about 7 dramatic warming and cooling periods before the relatively calm 1900-1990 period. It’s important to understand the causes of those past non-anthropogenic warming and cooling periods. As you say, the CET is not the world, but it correlates well with what we have from Europe (hardly any records from anywhere else) in the early 19th. century. We have to work with what we have. You can get the raw data and compare it to CET, and find plenty of years where there are major differences between the two. For example, the coldest year in the Stockholm record is 1867. In the CET it is a very average year. In the CET 1879 is the coldest year, while in Stockholm it’s relatively cold, but there are at least 20 years colder than that. In the period 1756 to 2012 the average annual difference between CET and Stockholm is 3.5 degrees, but you can find plenty of variation around that, ranging from a minimum of 1.5 to a maximum of 6 degrees difference. That’s how “well” this correlates in the West/Northwest of Europe. I haven’t checked the Central Europe reconstruction, as that is already a combination of many records, but wouldn’t be surprised to see similar major variability between that reconstruction and CET and Stockholm. Stockholm is 21st. out of 40. You are wise to look at individual station records, not combinations.